Unfortunately, I don’t have a picture of my own to accompany this story, which under its original title Baptism was written and copyrighted in 1995. I’m grateful to acknowledge the State of Florida archives of historical photographs, from which–if memory serves–it comes. 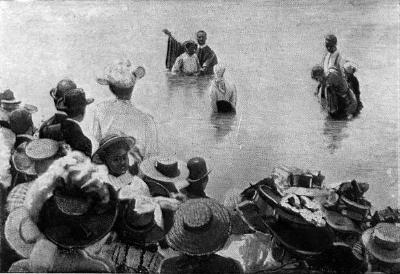 It features a black congregation gathered at a riverside full-immersion baptism ceremony in the style of the day. Other than the color of the participants and the earlier period of Florida history from which it comes, it illustrates my own baptism that took place in the late 1940’s. I had fibbed a little about stomach aches to get out of weeding tobacco beds, but that wasn’t sinful enough to need baptizing, was it? It made more sense to me to wait until I had racked up a few so they could all be washed away in one dip–maybe after I had learned to swim. The choice, alas, was not mine to make. Well-meaning adults in my life who had “only my best interests at heart” made it for me. So, on a warm afternoon in August, all the unbaptized from the Philippi Church who wanted to have their sins washed away and become one of God’s chosen gathered by the river at the state park, Camp O’leno. Whoever had them wore swimsuits. I wore an old dress Mama made from the flowered sacks the her chicken feed came in. I tiptoed into the water. My sister and I weren’t allowed to wear shorts and neither of us owned a bathing suit. I worried that people on the riverbank would see my underpants as the gathers of the heavy fabric began floating higher and higher around my hips–like a great flowered balloon. I shivered, whether from cold or embarrassment I’m still not sure to this day, and kept struggling to pull it down and hold it around my legs in the water. But I still felt colder and even more exposed than I could if I’d just gone in naked. To be quite honest, I was afraid of water and hoped I wouldn’t cry when my turn came. I edged away from the front of the line as I could while people edged closer to the preacher who was waiting waist deep in the tea-colored water, like John the Baptist wearing jeans with a white shirt and necktie with the tip end that looked like it wanted to float away just like I would if I knew how to float. He pinched their nostrils together, placed his left hand on their backs for support, and dipped them backwards until their faces disappeared completely beneath the water’s surface. They gasped once as the water began to close over their faces and again when they popped out seconds later, looking relieved that it was all over and happy they were free from sin. Then, much too quickly for me to be ready, it was my turn. I felt the preacher’s fingers pinching my nose. In the name of the Father, and of the Son, and of the Holy Spirit, I baptize and cleanse thee from sin into a new birth of innocence by water and the Spirit. Put thy trust in the Lord, God Almighty! The last sound I heard before I went under was the glub of water closing over my ears. Time seemed to stand perfectly still and everyone on the riverbank disappeared as I felt myself cut off from a world of temptation for what seemed like an eternity beneath the water. Surprised that I could open my eyes, I saw oak leaves and water bugs floating on the river’s surface as miniature bubbles drifted upwards from my face. I never knew the world of minnows and tadpoles was so quiet and peaceful. Alas, eternity ended with a swish, and I was raised up from the water a born again Christian. Water seemed to pour from every crevice. It was an experience I would never forget. When school started that Fall, I looked around the school one day when my friends and I were trying to decide what to do with our half-hour recess. Suddenly the green shrubs that lined the school building became for me a riverbed of green leaves. So I invited all my friends to play “baptism” with me. I was the preacher and they were all in terrible need of salvation. The game was so popular that even the younger kids started lining up for a turn at dipping in the green water. One by one I led them over to the bushes, pinched their noses, and supporting their backs as well as I could, dip them backwards into the bushes until their faces were covered with green leaves. Put thy trust in the Lord, God Almighty! I’d say. In real water, you keep your mouth shut so you won’t drown. But in green bushes–when you weigh more than the preacher does and the preacher drops you–you scream like Helen June did, and then Miss Myrtice comes running. Her face was a fiery red color and her eyes bulged in her head. Helen June was her cousin. Just what in Heaven’s name do you think you are doing?! And I told her. She said That’s BLASPHEMY and sent me to the cloak room to sit by myself until recess was over, and to think about that big new word I’d heard her say. I didn’t have the slightest idea what it meant, but I decided then and there–amid the clutter of baseball bats and stacked books with tattered covers–that I’d better not ever play that game again. And I haven’t. This entry was posted in Musings, Personal, sunny side of life by Alice. Bookmark the permalink. And so you should!!! What a great story! I wish my baptism had been as memorable! I remember wishing I was Catholic so I could not only enjoy a sprinkling I wouldn’t have remembered but those many opportunities of confession that would keep me constantly cleansed! Your Baptism was probably more memorable than you think, Rachel. Thanks for commenting. Cloak rooms weren’t all that bad, were they? You know, writing these tales all these years later makes me think I wasn’t the good little girl I’d always thought myself to be. I’m still not returned to the real world yet, but I surely appreciate your beautiful writing today and your gift of yesterday. Hugs………. Great story. My enduring memories about religious upbringing run along the lines of seeing how long I could hold my breath during boring Hebrew school classes. I wonder what would have happened if you’d challenged the teacher–as I challenged my Sunday School teacher (which probably isn’t anywhere near the same thing) with a question along the lines of “if god can do anything, can he make a rock so heavy that even HE can’t lift it? Someday I’ll have to share my experiences in the prayer room hoping to be there when Edna Mae–or anybody for that matter–started talking in tongues. Maybe they were trying to speak Hebrew? That’s another post for another time! Oh Alice, I remember that story in Knoxville and so enjoyed revisiting it. I attended many river baptisms as I grew up but I was never baptised myself in a river. Great storytelling. I thought you might remember it, Silver. By the way, it won third place in the N.C. Writer’s Network writing conference that year. It earned me a whopping $50. Did I ever tell you that? Love this post – was thinking about you this weekend as a friend was visiting and she’s Russian and she said on New Year’s Eve she and her husband were going to Skype with her family in Moscow and they would come onto Skype and say hi and then the family would say okay, bye and then an hour later they’d try again and the same thing would happen – Skypus Interruptus! – I told her about your Christmas with Skype and that perhaps it is because her parents just didn’t understand how to leave her on in the background as if she was there with them. I can see how someone not totally used to computers would have that problem. Heck, I remember years ago when telephones were new. The same thing would happen on long distance calls and they weren’t cheap either. To this day I have a sort of phone phobia just like my mother did. I don’t mind talking to people when they call me, I just have a difficult time being the one to call them. Psychologists would have a field day with that, wouldn’t it? (not that it would be worth study) Yoga (for me) will be next semester, and probably the evening class. Right now Hubby’s enjoying his in spite (or perhaps because) of the fact the class is huge and he stays in the back near some others as reticent to be seen as he. He’s learned a little physical therapy to strengthen his knees and had some shots (I call them glue shots), and today he announced he’s finally able to climb the stairs without his knee paining. It might be one or all of these, but he hopes the yoga will help to limber both of us up a bit! That would be huge for me. What a wonderful story! I can feel the water closing in over my head, the hot sun on the long grass, the confusion at the anger of the teacher. Beautiful. Thanks. That means a lot coming from you.